Me verses the Ants. verses Cinnamon. We’d had a little problem with ants for the past several months. Nothing we try stops them. They always come back. It’s annoying, Very annoying. But at this point, I just kind of accept it as a way of life. All our food containers go in ziploc bags. And all our open plastic bags get folded and clipped shut. It’s just the way it is. As I almost always do when I’m trying to find a DIY solution, I turned to Pinterest. I found that cinnamon is supposed to deter ants. Cinnamon, huh? I have cinnamon. Actually I have a pretty large container of cinnamon that I got at the dollar store or somewhere for really cheap that I can afford to waste doing experiments with. 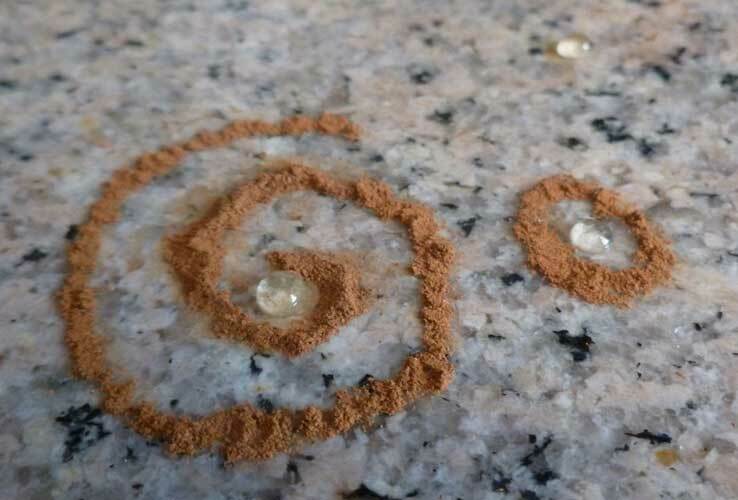 The past two days, while KP was at work (I’m sure he would not have been keen on this idea if he was at home) I sprinkled cinnamon on our counters and in the sink during the day. Surprisingly, hardly any ants showed up on those surfaces. So…with this possibly proven hypothesis, I started brainstorming ways I could test this further. I decided that what I needed was a cinnamon ant maze. Yes, like what fancy scientists do with lab rats. A cinnamon ant maze is what had to be done and would give me verified results. No ants seemed to care or notice! I tried brushing some ants over to the honey, but they just got stuck in the honey. And died I think. I then went and googled and discovered that ants don’t particularly love honey, because they get stuck in it too easily. Go figure. Now normally, I don’t want ants to come eat my food, but this time, I wondered what took them so long to get there!! 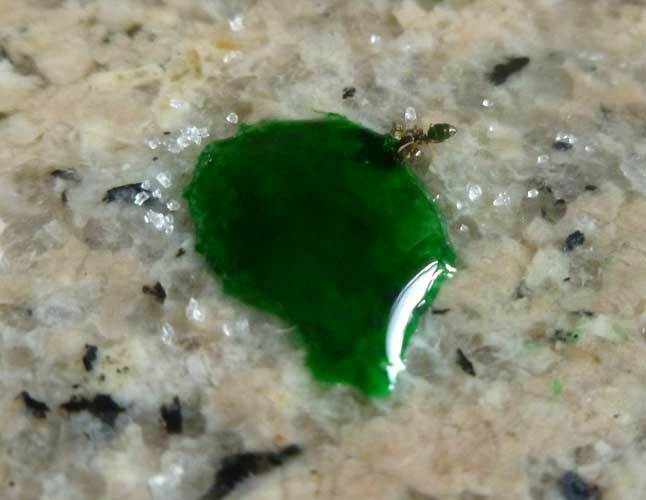 It probably took at least half and hour or something for more ants than normal to begin scurrying around on the counter, but they still weren’t all coming over to the sugar water! Hmm…a few did, but it was nothing like the pin, which is what I hoped I’d get. The whole time (which was only about 30-40 min. or so, really, I did not give this experiment time to work/not work), not a single ant played along and tried out my cinnamon maze. Bummer. 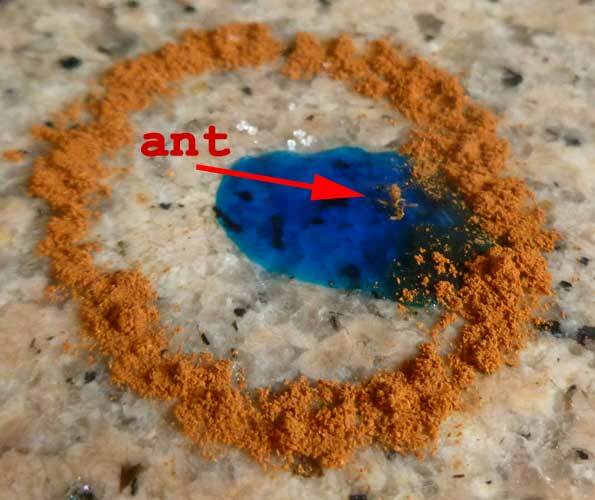 🙁 However, right at the very end, I noticed that an ant had gotten into the blue sugar water – the one with bait completely surrounded by cinnamon! He was covered in cinnamon though and seemed to be drowning in the blue sugar water. I tried to get some pictures, but it’s hard to see the ant. He just looked like a pile of innamon. « It’s the latest and greatest best idea ever! So funny!!! Love it. Of all the things we could spend our days doing it still amazes me at the things I really do. I’m just not as brave as you and openly admit I watch ants! Love it!!! Let me know it you find something that works…. I kinda wish I wasn’t living in Maryland at the moment ’cause I kinda want to come over and do this with you. I’m really curious to find out the results!